The postcard looks ordinary enough. It's a message written from a 20-year-old to his parents, informing them that he'd arrived safely in Meridian, Mississippi for a summer job. "This is a wonderful town and the weather is fine. I wish you were here," Andrew Goodman wrote to his mom and dad back in New York City. "The people in this city are wonderful and our reception was very good. All my love, Andy." The card was postmarked June 21, 1964. That was the day Andy Goodman was murdered. Fifty years have passed since Goodman and two other civil rights workers, James Chaney and Michael Schwerner, were ambushed and shot dead by the Ku Klux Klan in Philadelphia, Mississippi. Their bodies were found buried in an earthen damn in rural Neshoba County - 44 days after they went missing. The three young men had been volunteering for a "Freedom Summer" campaign to register African-American voters. Their efforts helped pave the way for the passage of the landmark Voting Rights Act in 1965 and their murders were dramatized in the 1988 movie "Mississippi Burning." Andy Goodman's fateful journey to Mississippi began in Manhattan, where he grew up in an upper-middle class family on the Upper West Side. His younger brother, David, says Andy was focused on fairness from an early age - whether it was protecting a little sibling from bullies or protesting social injustices around the country. As a teenager, Andy would take his younger brother to Woolworths, where people demonstrated against school segregation in the south. "He just said ... it's unfair that because of the color of your skin, you should go to a lousy school," David Goodman said. "It was an issue of fairness to him." That sense of social justice led Andy Goodman to Ohio in June 1964. It was there, at a training session for the Congress of Racial Equality, that the Queens College student would meet James Chaney, a black 21-year-old from Mississippi, and Michael Schwerner, a white 24-year-old from New York. They were training hundreds of other volunteers on how to handle the racial turmoil and potential harassment awaiting them in Mississippi. While in Ohio, Schwerner got word that one of the freedom schools he had set up in a church had been burned down. He and Chaney needed a volunteer to help them investigate the fire and they were quickly impressed by the level-headed Goodman. The three men drove down to Mississippi on June 20. The next day, they were stopped by the police and accused of speeding. After being released from jail that night, they disappeared - and a nation was riveted. President Lyndon Johnson ordered the FBI to assist local law enforcement officers in the search for the missing men. Johnson's aide Lee White told the president that there was no trace of the men and they had "disappeared from the face of the earth." Civil rights colleagues worried they had been nabbed by the KKK. Some locals dismissed their disappearance as a publicity stunt. Finally, on August 4, 1964, their bodies were found buried on the secluded property of a Klansman. All three men had been shot at point blank range and Chaney had been badly beaten. During the six-week search, the bodies of nine black men had been dredged out of local swamps. 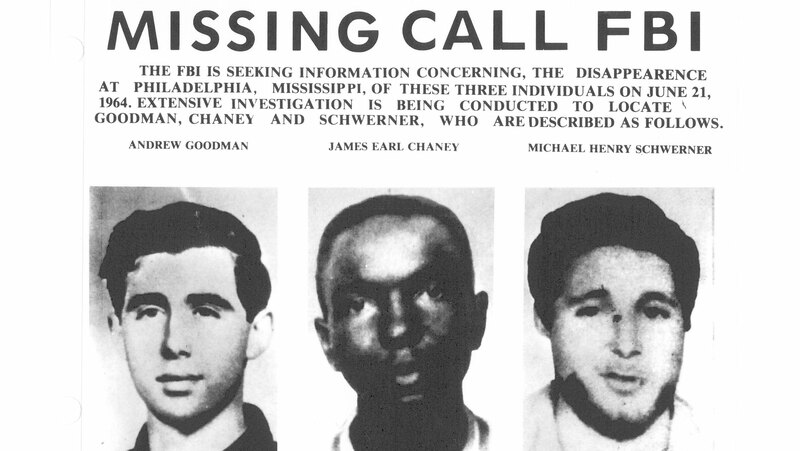 Though numerous African-Americans had been missing and presumed dead with little media attention in Mississippi during that time, the murders of Goodman, Schwerner and Chaney rocked the nation. Said David Goodman, who was 17 years old when his brother was killed: "It took two white kids to legitimize the tragedy of being murdered if you wanted to vote." It took four decades - and a determined reporter - to achieve a measure of justice in the case. In 1964, the Justice Department, then led by Attorney General Robert Kennedy, knew they were up against segregationist authorities who would never charge the alleged attackers as well as all-white juries who would refuse to convict the suspects of murder. So the feds prosecuted the case under an 1870 post-reconstruction civil rights law. Seven of the 18 men arrested - including the Neshoba County deputy sheriff who tipped off the KKK to the men's whereabouts - were convicted of civil rights violations, but not murder. None served more than six years in prison. Three Klansmen, including Edgar Ray Killen, were acquitted because of jury deadlock. But Killen's name would surface decades later, in large part thanks to Jerry Mitchell, an investigative reporter at the Clarion-Ledger in Jackson. Mitchell's interest in the case had piqued after watching a press screening of "Mississippi Burning" in 1988. A pair of FBI agents at the screening dissected the film for Mitchell and told the reporter what really happened. "The thing that was horrifying to me was you had more than 20 guys involved in killing these three young men and no one has been prosecuted for murder," Mitchell recalled. Mitchell, whose reporting also helped secure convictions in other high-profile civil rights era cases, began looking closely at the "Mississippi Burning" case. His big break came when he obtained leaked files from the Mississippi State Sovereignty Commission, a segregationist group that tried to curb growing civil rights activism. Mitchell found out that the state had spied on Michael Schwerner and his wife for three months before he, Goodman and Chaney were murdered. Mitchell was also able to obtain a sealed interview with Imperial Wizard Sam Bowers, one of the men convicted in the initial trial. In that interview, Mitchell said, Bowers bragged that he was "quite delighted" to be convicted and have a preacher who planned the killings walk out a free man. That preacher was Edgar Ray Killen. In 2005, Killen was arrested and charged with murder for orchestrating the slayings of Goodman, Chaney and Schwerner. At the trial, 89-year-old Carolyn Goodman took the stand and read the postcard that her son had written to her on the last day of his life. On June 21, 2005 - 41 years to the day after the murders - Killen was found guilty of manslaughter. Now 89 years old, he is serving 60 years in the Mississippi State Penitentiary in Parchman - the same prison that housed hundreds of Freedom Riders in the early 60s. The year after the Killen verdict, the FBI reached out to local authorities and other organizations to try todig up information on other racially motivated murders that were unsolved from the civil rights era. Mitchell says that task is increasingly hard given the dearth of solid leads and decades that have passed. The courts had finally acknowledged the "Mississippi Burning" killings but the public sentiment was mixed. After Killen was arrested, Mitchell says he was threatened by some residents in an area where a "let-sleeping-dogs-lie" mentality prevailed. One man wrote a letter in 2005 to the Clarion-Ledger editor, saying Mitchell "should be tarred, feathered and run out of the state of Mississippi." But Mitchell says others were grateful for the belated justice as Mississippi tried to shed its racially charged past. While it was a struggle for African-Americans to vote in 1964, Mississippi now has more elected black officials than any other state in the country. "Mississippi has come further really than any other state I think, but it had so much further to go than any other state too," Mitchell said. "There's still a tremendous amount of work to be done." David Goodman believes that sentiment holds true across the country as the issue of voter ID requirements is still hotly debated. After the Supreme Court struck down a key provision of the Voting Rights Act just last year, Andy Goodman's brother can't help but remember the summer of 1964. "It's like 50 years back to the future. ... Here we are a half a century later, basically talking about the same thing," Goodman said. "It's certainly a different incarnation in that no one's getting killed, as far as I know, because they want to vote but they're being kind of spiritually assassinated or restrained. It's in this day and age just as bad, relatively speaking. It's wrong." But Goodman does not dwell on injustice. Instead he is following in his brother's footsteps and taking action. He runs the Andrew Goodman Foundation, a group launched by his mother that pushes civic engagement and social justice through voting initiatives and journalism scholarships. Goodman says if his brother were alive today, he'd be doing the exact same thing. "What we're doing is - what I expect he'd be doing - is to get together with your friends and to create an action - a back-to-the-future kind of voter consciousness platform so you can get voter rights back on track," he said. David Goodman will be in Philadelphia, Mississippi on Saturday to talk about pressing social issues like voting rights. He will have a copy of his brother's 50-year-old postcard with him.